We had been planning to ski in Idaho the week of President’s day, but in early February it rained up to a pretty high elevation there and then got cold and froze into ice, so we decided to alter our plan to ski one of the last 2 resorts on our list in California – June Mountain. June is about 20 miles from Mammoth and is about 300-miles from our house in the winter (summer is closer when the pass is open). We also wanted to try a ski trip using our truck camper, which allows us to bring the dogs with us. Our preference is to camp in an RV park with electric hookups when available in the winter. This allows us to run a space heater which is quieter than using the propane furnace. In the morning we drive to the ski area parking lot and hopefully get close-in parking. We walk the dogs before skiing and eat lunch with them. I plan to create a page with more details on the truck camper and winter camping later, but the bottom line is that it did work out very well and we plan to do this a lot more in the future. It will be necessary to use it to take some longer trips up to British Columbia and maybe even the east coast so we can get more resorts done at a time. June was the best skiing we had on this trip, with soft, dry, chalky snow at the top. We skied just about everything that was open and it was a great time that we hadn’t necessarily been expecting. 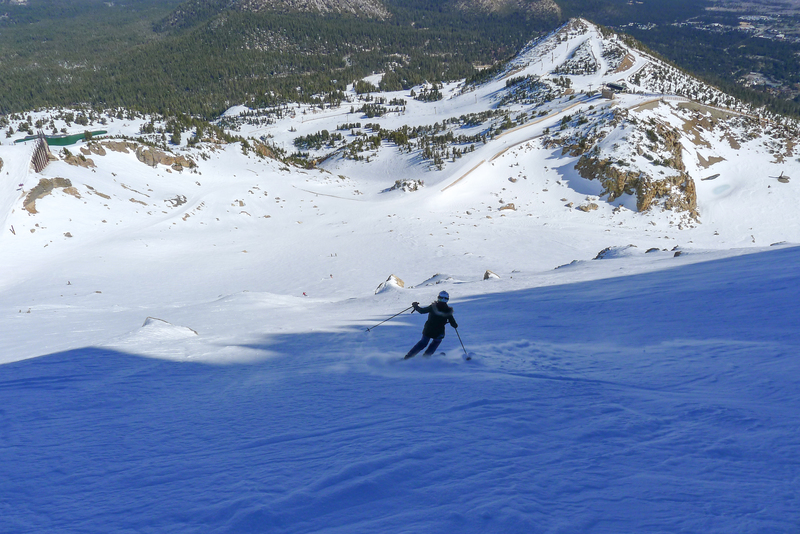 Mammoth was not nearly as much fun and we wish we had just skied another day at June. It’s crowded, icier, and the mountain is just not laid out that well with too many intersections and confusing and crossing lifts. The best terrain at the top is accessed from either a super scary chair (#23) which has no safety bars, or a gondola which forces you to take off your skis and crowd in with people that are always on the phone. Ug. The last day we swung back through Tahoe to stay at the house and ski our home mountain Heavenly. The snow there was REALLY bad, having been hammered by the sun and the holiday crowds. Icy in the morning and slush by 11AM. Oh well…we ski in all conditions and it’s better than going to work! This entry was posted in Uncategorized on February 18, 2015 by Ron Thompson.